I came to this novel without a single pre-conceived notion. I am somewhat ashamed to say that I knew nothing beyond the title, which is suitably evocative and mysterious. 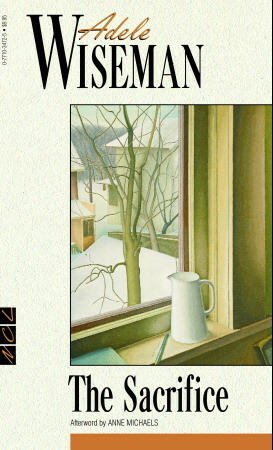 My copy's cover (Macmillan Paperback 1988) depicts a silhouette of a train car and the image of a young man in one window. 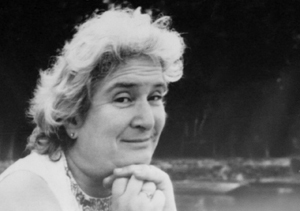 All I knew about Adele Wiseman was that she had been friends with Margaret Laurence - that both had originated in Manitoba, and that they corresponded frequently enough that their letters have been published in book form (John Lennox, ed.). Reading this book "blind" was a wonderful experience, for the story unfolds in a gentle manner. I hardly know what to say here because I so much enjoyed this gradual unfolding. I will therefore be very vague about what I write so as not to ruin the experience for anyone else. I will say that, if not exactly a modern reworking of the biblical story of the life of Abraham, The Sacrifice draws heavily upon it. Ahhh, Abraham... the sacrifice... for those of us with Judeo-Christian heritage this may ring some bells! This Abraham, like his biblical counterpart has a son named Isaac (and a wife named Sarah, to bring the point home). The biblical Abraham obeys the message from God and is on the verge of sacrificing his son when God spares Isaac and presents Abraham with an animal to sacrifice instead. Adele Wiseman explores many themes, beginning most obviously with the nature of sacrifice. There are as many variations on the theme as there are characters. As though summoned, the conductor entered the coach. Abraham turned his head and beckoned imperatively. "Where are we?" he asked in Ukrainian, tentatively, his red-rimmed eyes gleaming with excitement, his loud voice muted to a hoarse whisper. The man stooped, his face polite, questioning, and to Abraham offensively vacant in its noncomprehension. "I beg your pardon?" he said in English. "Where are we stopping, please?" Abraham asked urgently in Yiddish, speaking slowly and patiently so that the man must understand. The conductor shook his head. "No speak, no speak," he said, pointing to Abraham's mouth, then to his own, with a deprecating gesture. Abraham looked at the man with irritation. Was there anyone on the train who could do anything but make faces and smile? "Why does the train stop?" he asked suddenly, hopefully, in Polish. The conductor shook his head helplessly. Abraham leaned forward and gestured wildly toward the window to where the lights blinked in the distance. The conductor, as though realizing something, smiled a broad, reassuring smile, shook his head vigorously, patted Abraham lightly on the arm, and made as if to move on. "The train! stop! why? What city? roared the Jew in exasperation, spitting out the words in broken German. [...] "Animals here," muttered Abraham, subsiding and turning helplessly to his son. "They can only gibber and gesticulate." It is the native who is uneducated and unintelligible, bestial in his ability to "only gibber and gesticulate," as viewed by the multilingual immigrant. This play with perspective continues throughout the novel as Adele Wiseman explores each character from various points of view: we learn through the omniscient narrator, through their own inner dialogue, and their actual dialogue the true nature of each character. This free access allows us a clearer view into their personalities and motivations. The well-intentioned are understood even when their actions cause pain; the shallow and misguided are not redeemed through their thoughts. Because we become so well acquainted with each character there is a verisimilitude in every action. We experience such a range of emotions in The Sacrifice: there is the loneliness of the aging widow, the grief over lost family members, guilt of the survivor, pride of father for son, love and pain and joy and terror. Awarded the Governor General's Literary Prize for Fiction in 1956, this was Adele Wiseman's first novel. Her parents were Russian Jews who had fled the pogroms. Although she was writing no doubt from her own experience there is never a feeling of the autobiographical first novel (no angst-ridden young writer character madly scribbling in the corner!). With the sublety of an old pro, Adele Wiseman creates a complex character-driven story. It is one of those "not much happens" kind of books, until all of a sudden it does and then all the character building pays off, and we have real insight into the motivations that drive the action. Although I really, really enjoyed this novel, I will admit that even while enjoying every page, The Sacrifice felt slow-moving at times. But, it drew me in to the community, focusing on the family and a small circle of their friends and associates. Just as my enthusiasm was on the verge of dipping, I once again became riveted and the last quarter of the novel is thought provoking and dramatic and had me on the edge of my seat. This novel will reward repeated re-readings, and I enjoyed it enough to do just that. In fact, this would make a wonderful subject for an indepth study. Beautifully written review. Is this part of your Canadian project? Are you Canadian, or did you have some other reason to make it a point to read Canadian fiction? I didn't realize, till I found your blog, how unfamiliar I was with the literature coming out of Canada, even though I perform in a singing group with some very dear Canadian friends! Thank you so much, Samantha! I appreciate your kind words. I am Canadian :). And like many Canadians I find myself unfamiliar with a lot of our literature! I'm curious to fill in the gaps and read some of the authors I know only by name. Canada has a relatively young publishing industry, internationally speaking, and has had to struggle even within its own borders to be taken seriously. The New Canadian Library was created in 1958 for the purpose of making inexpensive copies of Canadian literature available for university courses, and the reading public. I've been collecting the NCL and picking away at them all my adult life, but the older editions are getting more and more difficult to find, so I've made it a project to try to get my hands on as many as I can and read them this year. How interesting! I'm glad that press exists. I collect Viragos for the same reason: balancing an uneven canon. I wonder if Canadian literature has wide-ranging themes or whether a defined Canadian national and cultural identity comes out in its works. If you are really interested in the topic, I would recommend Margaret Atwood's "Survival" a study of CanLit written in 1972 but still hugely relevent and recently republished by House of Anansi Press.